When Ricky forbids Lucy to get "one of those new Italian haircuts," she rebels by borrowing a wig from her hairdresser, Roberta (who insists Lucy looks like a different person with it on) with the intention of testing Ricky's fidelity. The salon manager, Doug, tips off Ricky to the scheme, so when Lucy starts flirting. Ricky flirts back: "I could even teach you to Rumba." Lucy returns home fuming mad, a divorce would be the easy way out, she reasons. Ethel: "Yeah, stay married to him. That'll teach him!" Posing as the "other" woman, Lucy makes a date with Ricky, telling him she'll bring along a friend. The friend, of course, is Ethel, who enlists the help of "Mother" Carroll, an old vaudeville friend who runs a local costume shop. The girls appear at Tony's Italian Restaurant at the appointed hour. Lucy is dressed in a slinky gown and black wig, while Ethel, unable to rent one complete costume from her friend, wears mismatched portions from three different outfits - Eskimo, oriental, and American Indian, prompting Lucy to crack: "You look like an ad for a trip around the world!" The waiter, playing along with Ricky and Fred, tells the girls that their "dates" have just left with a blond and a redhead. Lucy now figures her plan has backfired: "I wish I were dead." Ethel: "I wish you were dead, too!" As they start to leave, Ricky and Fred sneak out from the kitchen and surprise them, and as usual, all is forgiven. 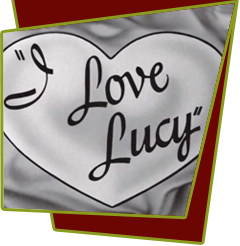 Special Notes: This episode is based on lucy's radio show, My Favorite Husband, Episode #48, "Hair Dyed".